Overwrought by grade-schoolers and wanna-be poets, the haiku has been abused unintentionally for far too long. While the haiku in its purest expression is both lyrical and majestic, these humorous poems instead offer commentary on modern life. 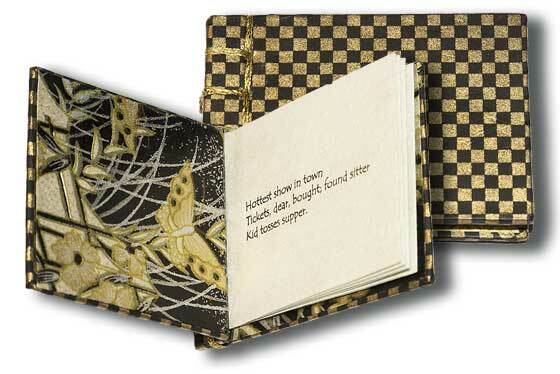 Printed on pale green mulberry paper with covers of black and gold chiyogami (checks on the outside, and landscape with butterflies on the inside), miniature Hinky Haiku is bound in the yotsume toji, or four-hole style. Book measures: 2" x 2.94". Edition of 20, $115.